Recently I installed LogMeIn app, and installation was done properly. There was no icon of app was made. I am searching but I am not getting the file or app related information in the system file. I am not sure whether it is Hidden or not. Or it got uninstalled automatically. Now, What I want is, how can I search my entire Macbook which looks into all files either hidden or not hidden, and tells me whether there is any file related to that app or not with complete surety. Note: I did search about this app on internet and people are saying that it is hard to locate the files of this app and it is hard to delete and does not show up in normal search, even I tried their methods but it is not helping. So first I want to make sure that whether that app is there or not. In general, it's rather difficult to track every file installed by one application installer (that is if the application files are not consequently self-contained within the .app file). 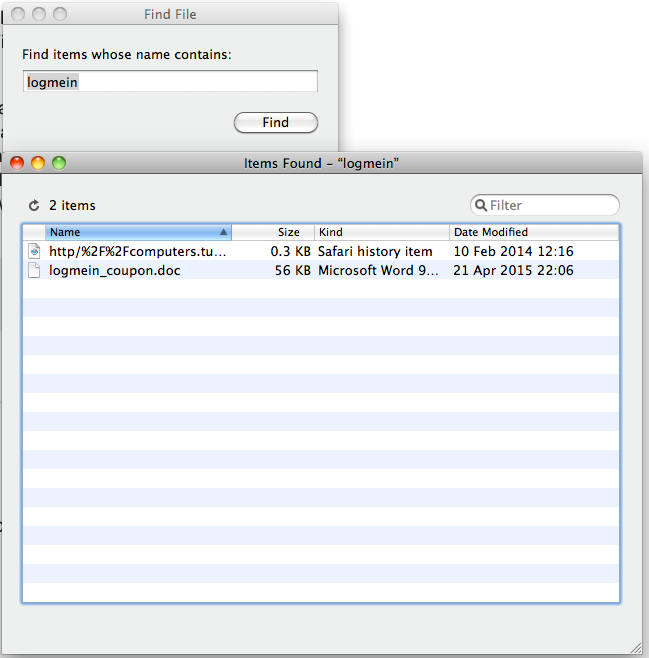 A) The Finder's Spotlight search has an option to search files by their date of addition, but the Spotlight search doesn't include Library and System folders. A better search application I would recommend instead would be Easy Find (freeware by Devon Technologies). It has extensive search options and will walk through the whole system, and includes hidden files/folders. B) If the application installer came as a standard installer package, a '.pkg file', you can often use the package tool Pacifist (shareware by CharlesSoft) to open it and list the contained files with their target folder locations (in Unix: directories) on the machine. Then you go to these folders in Finder (or the Terminal) and delete files/folders 'manually'. What you ask isn't generally feasible. Installing an application can do many things in addition to making a new file on the filesystem in many locations. It's really up to the app developer to follow convention and/or provide a document of what is changed and/or provide an installer that takes into account all the things the application changes. If you want to be disciplined, you could always run a time machine (or other backup) before installing any app. By quitting all other apps, you will minimize the false-positive changes to the filesystem. Then immediately post installation, run tmutil compare or another backup and run a script to list all the changed files. The quick way to find all the files is John Chang's Find File. It simply makes available the old whole volume search by name from before Spotlight. Find File is faster than DevonThink's clunky version EasyFind (which I used before). Once you are done deleting all the files associated with the application, you should go through all the Launch scripts to make sure that your uninstalled application isn't trying to raise the dead (you'll get a lot of console errors if it is). Lingon will help with finding those. 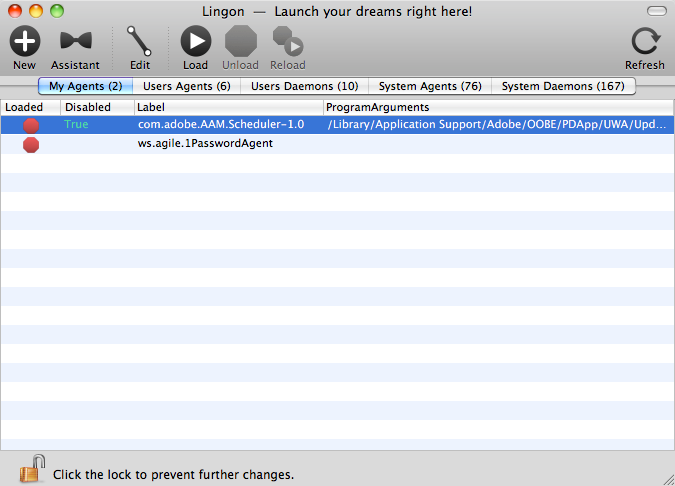 There's an older free open source version of Lingon as well as a new paid one ($10). Go through My Agents, Users Agents, Users Daemons looking for mentions of LogMeIn. When you find them, disable or delete the plist. You can also look for them by hand. Not the answer you're looking for? Browse other questions tagged macos applications install search . How to confirm that a file has copied to a new disk without any errors? Is it true for application that are installed by “dragging” into the Applications folder, it can be copied to other Mac? How can I search my entire drive for a file without getting recursively stuck in /Volumes? How to get Open File selector to show hidden files? Search directory of .psd files for specific text?